When we left Dylan O’Brien and his fellow Maze Runners at the end of movie one in Fox’s serialisation of James Dashner’s YA sci-fi series, they were… well, let’s not give it away for the sake of those yet to see the movie. Suffice to say, some have survived their first trial and are being whisked away to an uncertain future. Here, courtesy of two first-look images from the sequel, The Maze Runner: Scorch Trials, is a clue as to exactly how uncertain that future is. Click on the stills for a closer look. As the title implies, they’re not off for drinks and a spot of post-Maze downtime. Check out the weaponry. Marvel at the true grit. Imagine the industrial zone in that old C4 telly stalwart, The Crystal Maze, only presided over with demonic zeal by a psychotic Mumsy: that’s where the young cadre find themselves. It’s a hardscrabble landscape filled with horrors they must surmount as they tackle the nefarious W.C.K.D. and its superior numbers and firepower. 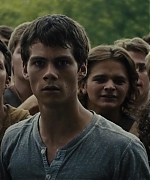 Alongside Thomas (O’Brien) and the mysterious Teresa (Kaya Scodelario), Newt (Thomas Brodie-Sangster) and Minho (Ki Hong Lee) return for the sequel, joined by newbie Jacob Lofland (Mud) and Barry Pepper, presumably joining Team W.C.K.D.. Patricia Clarkson is also back to spin her character, Ava Paige’s sinister web. 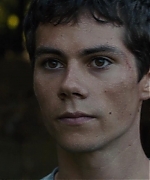 The Maze Runner: Scorch Trials lands in the UK on September 18. Out of the maze and into the fire. In The Scorch Trials, the sequel to last year’s YA hit The Maze Runner, the action picks up immediately where the previous movie left off—with Thomas (Dylan O’Brien) and the survivors of that giant mechanical labyrinth discovering that the world outside their walls is far from a welcoming one. “The first movie was the mystery of ‘Where are we and what is this place? And can we get out?’ But the second movie is about the repercussions of getting out and the discovery of what the world is actually like,” says producer Wyck Godfrey (The Twilight Saga, The Fault in Our Stars). Based on author James Dashner’s 2010 novel, The Scorch Trials begins with the revelation that the maze and the grassy Glade at its center were constructed by the nefarious organization WCKD to train young mind-wiped survivors after a massive solar flare devastated the planet. “It has transformed the world into a desert with sand dunes that crawl and are swallowing the ruins of a lost world,” says director Wes Ball, who returned for the sequel. 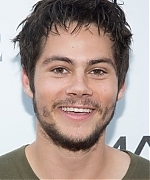 Dylan attended a screening of “The Maze Runner” that was hosted by Twentieth Century Fox and Teen Vogue on September 15th. I have added photos from the screening to the gallery! 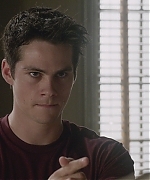 Compare “Teen Wolf” with the “Maze Runner” shoot. (In “Teen Wolf”), my character has the least amount of action on the show. It’s kind of the same mode as “Maze Runner.” Both characters are always helpless and trying to survive. How did you and “Maze Runner” co-star Will Poulter get along? Straight off the bat, we just clicked. When I met up with him later in his room, the whole cast was there cooking dinner. From there on out, we were always together. You’re no stranger to Comic-Con, having gone for “Teen Wolf.” This year, you repped two projects. I was told it was going to be crazier, and I ended up thinking it was easier, because I was bouncing back and forth talking about both projects rather than one thing all day. Which fan base would you say is the most passionate? I haven’t gotten a huge glimpse of the “Maze Runner” fan-base quite yet. Seems similar with age and casting, and they share a similar audience. To me the “Maze Runner” fans have been so supportive of everything I have done. It makes it easier to adapt a book that is popular with kids because of how excited they are about the project you don’t get the criticisms you would get with other projects. What is the strangest thing a fan has done at the Con? I have added HD screencaptures of Dylan from the season finale of Teen Wolf “Smoke & Mirrors” to the gallery. 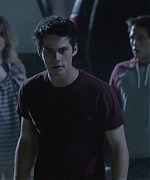 I have added episode stills Dylan from the season finale of Teen Wolf “Smoke & Mirrors” to the gallery! I’ve added two new outtakes from a photoshoot Dylan did with his co-stars Kaya and Will from The Maze Runner to the gallery. I have added some missing “The Maze Runner” stills to the gallery along with HQ photos from the Just Jared TMR screening on August 22nd. Thanks to Renee for the photos!